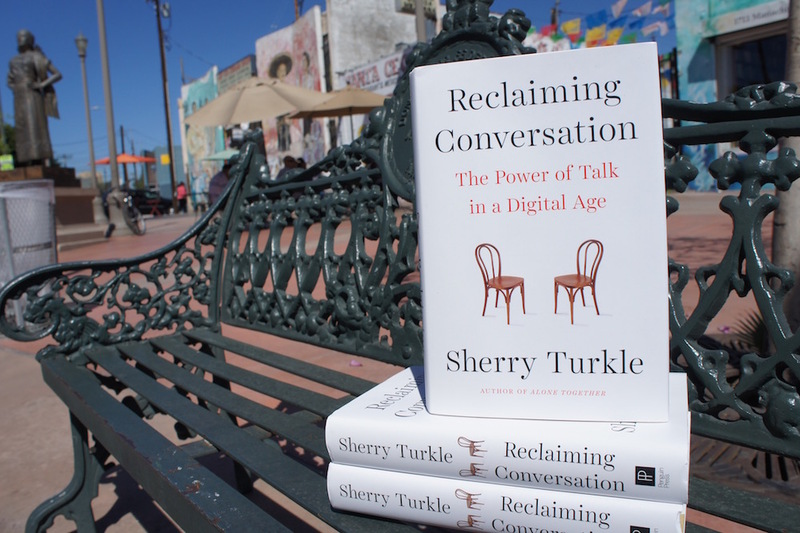 Sherry Turkle, author of Reclaiming Conversation: The Power of Talk in a Digital Age, is the winner of the sixth annual Zócalo Book Prize, which is awarded to the author of the nonfiction book that best enhances our understanding of community, human connectedness, and social cohesion. Turkle argues persuasively that our era of smartphones, Facebook friendships, and constant text messaging has proved that E.M. Forster’s exhortation “Only connect!” is not enough. We are constantly in connection, yet we have forgotten how to talk to one another. As a result, we are losing our ability to empathize and love, and to be thoughtful students, innovative workers, and good citizens. For more than a decade, Zócalo Public Square has been working to strengthen our social fabric by bringing people together around fundamental questions, and by recognizing, presenting, and publishing thinkers who investigate how, why, and where we connect. The Zócalo Book Prize, and our annual poetry prize, are critical components of this work, and are designed to encourage more writers to consider these questions. Sherry Turkle has spent more than 30 years studying how our digital culture affects the ways we relate to one another. Trained as a sociologist and a licensed clinical psychologist, she is the Abby Rockefeller Mauzé professor of the social studies of science and technology at MIT and is also the author of a number of other books, including Alone Together: Why We Expect More from Technology and Less from Each Other. As the winner of the Zócalo Book Prize, Turkle will receive $5,000—and on Wednesday, May 11, she’ll deliver a lecture: “Why We Must Relearn the Art of Conversation” at the Museum of Contemporary Art in downtown L.A. Please see more details on the award ceremony here. Q. How has the advent of the smartphone changed our human relationships with one another? A. The smartphone, a technology that is always on and always-on-us, means that we are always tempted to be “elsewhere.” And we give in to this temptation. We divide our attention between the people we are with and all the people and places we can reach on our phones. Yet the mere presence of a phone in a conversation, even a phone turned off, means that conversation turns to more trivial matters, and we feel less connected to each other. So, not by design, our always-on world has led to an assault on empathy. But it is in conversation that empathy and intimacy are born and nurtured. To the failing connections of our digital world, conversation cures. Q. But are there ways that we can use technology to have real conversations—and nurture our empathy and intimacy? A. I personally think we need to begin with basics: the capacity to speak to each other face-to-face. That doesn’t mean that technology doesn’t have its place in maintaining long-distance relationships or putting us in contact with people and places that would otherwise be unknown to us. But consider this: After completing a study that showed that college students in the past 20 years showed a 40 percent decline in the markers by which we measure empathy, the lead researcher, depressed by her findings, turned to writing “empathy apps” for the iPhone. I think that this impulse to turn to technology to solve problems that technology has created can alienate us from our own experience. In my view, again, conversation cures. We are the empathy app. Q. Do you see evidence of damage wrought by our flight from conversation in this divisive presidential election? A. Yes. We bemoan the lack of civil discourse and debate and yet, for many election cycles, we have turned to sound bites and media-ready, simplified messages instead of debating issues in their complexity. Online we are tempted to ask questions that are simple enough to be answered in an email. We dumb down our questions because we expect answers to be available in a quick response or in a “search.” But the problems we face are complex and multifaceted. Conversation teaches a respect for the complex. It is needed now more than ever. Q. One of the motifs in your book is a quotation from Henry David Thoreau’s Walden: “I had three chairs in my house; one for solitude, two for friendship, three for society.” Technology, you explain, is also eroding our ability to be alone, to be bored. How does the solitude chair make us better at talking and being and working together? A. The capacity for conversation begins with the capacity for solitude. When we can be alone, when we can gather ourselves, we are in a position to listen to other people, to hear them, to recognize them for who they are instead of relying on them to support our fragile sense of self. Thus, the capacity for mutuality, for relationship, begins with the capacity for solitude. Here, too, technology seems to have put us at risk. Studies show that people can feel near panic if they are left alone without their devices. In one experiment, after just six minutes sitting alone, college students begin to self-administer electroshocks rather than continue the experience of being alone with their thoughts. Reclaiming conversation begins with reclaiming solitude. Q. So where do we start reclaiming and relearning conversation? A. Put down your phone and begin a conversation. Create dedicated spaces in the kitchen, in the dining room, in the car, in designated areas in the workplace, that are device-free. At work, ban phones from meetings. To reclaim conversation, we have everything we need. We have each other. Turkle joins a distinguished list of previous winners of the Zócalo Book Prize: Harvard political philosopher Danielle Allen, MIT Center for Civic Media director Ethan Zuckerman, New York University social psychologist Jonathan Haidt, London School of Economics and New York University sociologist Richard Sennett, and journalist Peter Lovenheim. Zócalo thanks this year’s panel of judges for their keen discernment: Harvard’s Allen; Pete Peterson, dean of Pepperdine University’s School of Public Policy; Claudia Puig, a critic for KPCC’s FilmWeek segment and long-time film critic at USA Today; Zócalo’s publisher and founder Gregory Rodriguez; Jervey Tervalon, an award-winning novelist, poet, screenwriter, and dramatist; and Fernando Torres-Gil, a professor of social welfare and public policy at UCLA who directs the Center for Policy Research on Aging.